JetBlue and PBS KIDS Soar with Reading! > Blog > JetBlue and PBS KIDS Soar with Reading! JetBlue crewmembers, PBS KIDS host Mr. Steve and PBS KIDS Characters Hooper and Super Why! touched down at the Anacostia Neighborhood Library this week to encourage children to keep reading over the summer. 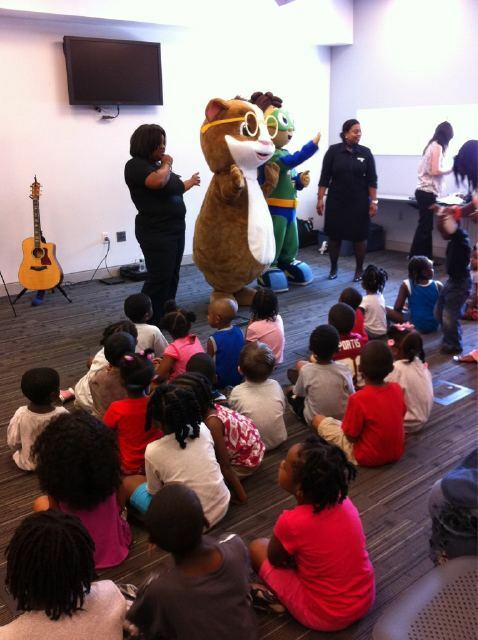 This summer, JetBlue and PBS KIDS launched the Soar with Reading program. Children traveling on JetBlue flights will receive a free activity kit with reading games based on PBS KIDS educational programming. With help from PBS KIDS animated host Hooper, the campaign will also encourage kids to learn about the world around them through imaginative travel: reading books and playing learning games on SoarwithReading.com. As a part of this Project we are proud to announce our partnership with JetBlue. JetBlue has pledged to make a book donation to a child through First Book, for every child who registers at SoarwithReading.com-up to 10,000 books! We would love to reach the 10,000 book goal, so visit SoarwithReading.com and register today. While you’re there check out their reading list and pick out a book for you and your child to read together as well!